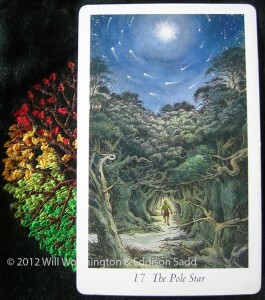 Today we have the hope of the Pole Star to journey through. Given the events in Boston, Massachusetts on Monday. Hope seems to be the order for the next few days. The events in Boston on Monday the 15th came as a shock to most of the World. What was even more surprising was the speed at which the World found out. Yes, the news channels covered the events, however, I find the news depressing and soul-destroying (you hardly hear good news), so I never normally watch those channels. It was Twitter, Facebook and the art of social media that alerted most of the waking world to the events unfolding in that state, myself included. 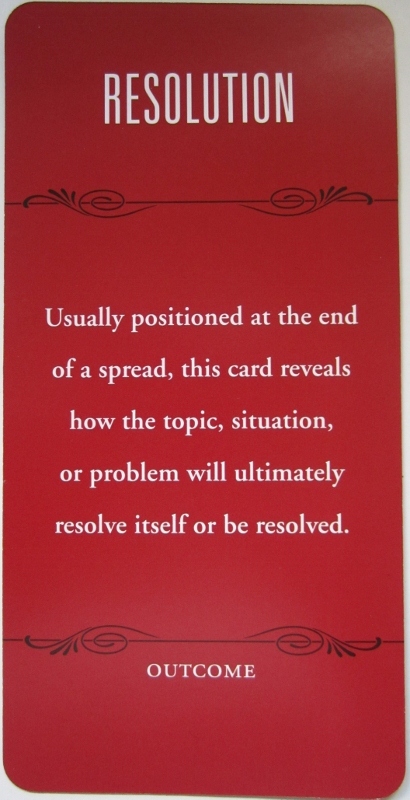 Before that, I had already pulled the Pole Star card and the Resolution outcome card from 1000 Spreads and with that event unfolding, I knew part of what this card’s insight was and what this mid-week blog post was going to be about. At the moment, the reason for the tragic events of Monday are not clear. There’s a lot of theory and not a lot of public fact but a heck of a lot of speculation and finger-pointing, which is not doing anyone any good. The Pole Star reminds us that we have hope, we always have hope. It’s not always Hope as defined in Star Wars, it’s not always shiny and fluffy. 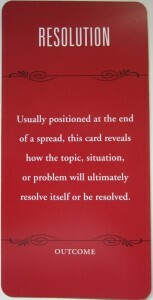 As Amanda Donnelly pointed out in a post to her Tarot Group the other day, Hope is radical, crazy and doesn’t always appear as we wish it to be, neither is it shiny and sparkly. However, with the events in Boston, there has to be hope. Hope for the healing of those injured. Hope to those families who have lost loved ones. Hope for Justice being served to the right people and that it’s not done as a knee-jerking reaction. Hope that the pain of the last few days lessens. Hope that our children grow up safely. In contrast in Iraq, 25 bombs went off on the same day, 66 people died: But the media do not report that. I’m not saying what happened in Boston isn’t terrible, it is. But so is the situation in other countries where fellow citizens care not a jot and blow others up. There’s hope for them too. There has to be. That I feel, is the resolution: Hope. Interesting the blame game started very soon with one of injured men because he was non white having his home raided. Although on a positive so much love was sent almost as soon as it happened as people responded from hearts and sent devine loving energy! The star is seen by many as a good thing the star told the wisemen where Jesus was, people wish upon a star, Madonna sang about a lucky star. In the film stardust, Ivaine the fallen star, talked about what made looking at Earth bearable was watching how love manifests. There is always hope but its never always appears as we want it to!! Louise, I had a very similar reaction as you–thinking about how little we react to the daily violence and bombings around the world and then the shock when something hits home. Some of that is probably human nature. How can we not react when a place we recognize is suddenly hit with violence? The Boston Marathon stands for a lot, both in Boston and around the country. It’s very personal. Still, I wish we could manage to find our horror for bombings that take innocent lives all over the world. I heard about the story on the radio and then on-line, and it was, indeed, personal. This is the first year in six years that my oldest step-son hasn’t run in the Boston Marathon. His wife’s sister was at the locale of the bomb just 10 minutes before it exploded. I can’t imagine how different our lives could be this morning, and so grateful that we were not directly touched. When it’s on your door step, you have to react, then its personal. I totally get where you’re coming from though, but my point was hope: it’s needed in all its crazy, weird guises. I’d never heard of the Boston Marathon until Monday gone and I’ve learned a lot about it since. I am pleased you’ve not been personally touched by this event, but I hope that you and yours stay safe. I love what you talk about here and want to thank you for reminding us all that in the midst of so much tragedy there always is hope, because life does go on. Also, thank you for pointing out all the other live that were lost around the world that did not get equal attention by the media. Those are tragic stories as well that need to be recognized. I Hope that the light of the Star shines its way into his heart… And into the hearts touched by Monday’s events.